Name of a Marano family living at Lisbon. Gideon Abudiente, about the end of the sixteenth century, is the earliest bearer of this name of whom we have cognizance. His son, together with some other members of the family, emigrated, early in the seventeenth century, to Amsterdam, where they reverted to the Synagogue. From here some Abudientes went to Hamburg, and others to London, where they seem to have borne the double name Gideon-Abudiente; but in England the descendants discarded the second part of the name and called themselves Gideon. In the lists of the Portuguese congregation at Amsterdam, for the year 1675, the names Eliau Obediente, Jeudah Obediente, and Jeudah Raphael Obediente appear. Lucien Wolf, The Treves Family in England (reprinted from the Jew. Chron. ), p. 15, London, 1896. A prominent Dutch scholar and mystic; born about the beginning of the seventeenth century; died after 1666. He lived in Amsterdam, and his signature is among the first on the letter of homage sent by twenty-four distinguished men of Amsterdam to Shabbethai Ẓebi in October, 1666. Uncle of Moses Gideon Abudiente, whose "Grammatica Hebraica" he commemorated in a Spanish sonnet prefixed to the work. A son of Moses Gideon Abudiente, and, like his father, gifted with poetical talent. He wrote a eulogy on Joseph ben Isaac Penso's "Pardes Shoshannim" (Garden of Lilies), Amsterdam, 1673. 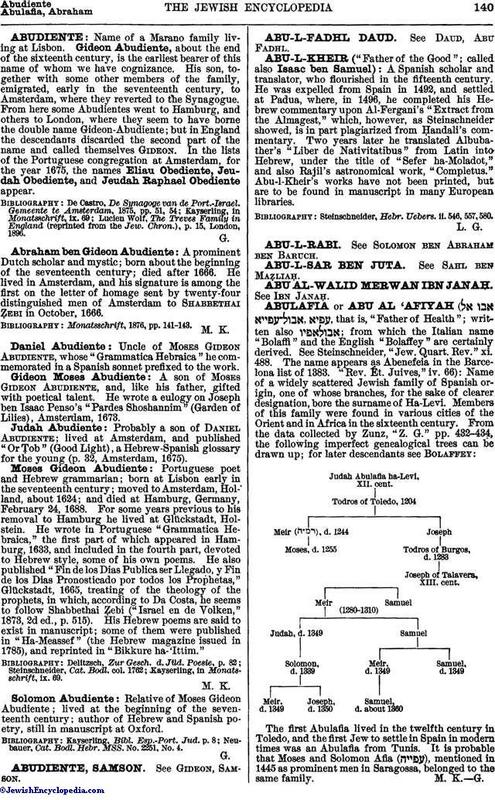 Probably a son of Daniel Abudiente; lived at Amsterdam, and published "Or Ṭob" (Good Light), a Hebrew-Spanish glossary for the young (p. 32, Amsterdam, 1675). Portuguese poet and Hebrew grammarian; born at Lisbon early in the seventeenth century; moved to Amsterdam, Holland, about 1624; and died at Hamburg, Germany, February 24, 1688. For some years previous to his removal to Hamburg he lived at Glückstadt, Holstein. He wrote in Portuguese "Grammatica Hebraica," the first part of which appeared in Hamburg, 1633, and included in the fourth part, devoted to Hebrew style, some of his own poems. He also published "Fin de los Dias Publica ser Llegado, y Fin de los Dias Pronosticado por todos los Prophetas," Glückstadt, 1665, treating of the theology of the prophets, in which, according to Da Costa, he seems to follow Shabbethai Ẓebi ("Israel en de Volken," 1873, 2d ed., p. 515). His Hebrew poems are said to exist in manuscript; some of them were published in "Ha-Meassef" (the Hebrew magazine issued in 1785), and reprinted in "Bikkure ha-'Ittim." Kayserling, in Monatsschrift, ix. 69. Relative of Moses Gideon Abudiente; lived at the beginning of the seventeenth century; author of Hebrew and Spanish poetry, still in manuscript at Oxford. Neubauer, Cat. Bodl. Hebr. MSS. No. 2251, No. 4.